Under the economic structure of the Soviet Union, people accrued even the most basic staples of daily life such as bread by standing in line. If there’s one brew in the craft beer universe that could turn even the most ardent titans of capitalism into communists, it would be Pliny the Younger. But all beer lovers are held hostage by Younger—no matter what their thoughts on Das Kapital happen to be—due to that foundational law of economics: scarcity. Younger is a triple IPA made once a year that’s only made available in the Russian River Brewing Company’s taproom in Santa Rosa, Calif., and at a few bars and restaurants around the country, usually in February. But while Younger is about as common as an unforced smile during a military parade in Red Square, enough craft beer comrades have catapulted Younger to the top of many lists of the world’s best beers. A few Denver beer hot spots began tapping kegs of Younger this past weekend. Most hang-outs get enough for one pouring, but The Falling Rock Tap House routinely has three. Folks hoping for a taste began gathering at the Tap House’s front door before 9 AM. By 11 AM when the Tap House opened for business, the line stretched down the block to the corner of Blake Street and 19th. Russian River’s Pliny the Elder, Blind Pig IPA and Damnation golden ale were also on tap so beer geeks could easily craft a Russian River Beer Fest before the early afternoon Younger tapping. As pour-time approached, Tap House owner Chris Black reminded the crowd about the rules and beer lovers began lining up at the bar. At 1 PM, Black started filling 10-ounce snifters with Brewer Vinnie Cilurzo’s copper-toned goodness using the kind of efficiency that would make Politburo members long for days before the revolution. Any lingering doubt about whether the wait was worth it wafted away with the first sniff—a lovely floral, citrusy perfume that immediately sets Younger apart from most, if not all, other beers. What strikes most people about Younger’s taste is its balance. At more than 10 percent ABV with triple the amount of hops as a standard American IPA, Younger somehow manages to avoid overpowering drinkers with the kind of bitterness and heat found in Soviet-era vodka. That balance makes the beer so smooth, even the most tested beer snobs take notice while neophytes lucky enough to get more than one glass can’t remember why they got plastered so fast and why they have vague memories of an angry Russian cab driver. Even though Younger is scarce, it is attainable without as much effort as, say, a defection. 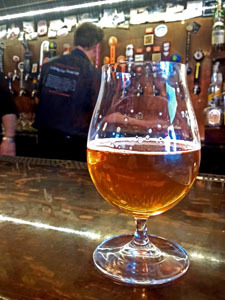 So if you have the chance to try a Pliny the Younger, take it—even if you have to stand in line. With Karl Marx.